Bottled water IS tap water…so why are we wasting money and polluting the environment? Environment > Bottled water IS tap water…so why are we wasting money and polluting the environment? I saw a segment on CNN in which PepsiCo admitted that Aquafina is tap water. And while Coca-cola wouldn’t admit it as publicly as PepsiCo, the company has also stated that Dasani is tap water (admitted as far back as 2004). Why are we paying for it? And why are we paying for a plastic bottle that we use once and throw away? 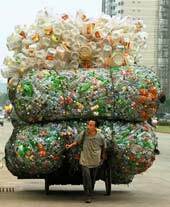 That’s 38 billion water bottles a year in landfills, in excess of $1 billion worth of plastic and billions of dollars in oil/gas to ship, fly and drive it to us. The 15 billion dollar bottled water industry has been steadily growing over the past decade and is now second only to soft drinks. But if it’s tap water in disguise, why are we giving away our money? Why are some people paying $55 for a bottle of Bling that claims to be “more than water?” It is only water. The mayor of San Francisco, Gavin Newsom, banned city departments from purchasing bottled water, encouraged the use of tap water and saved the city a half million dollars, not to mention millions of bottles from the landfill. Now the new snob appeal is tap water…at least in California. New York plans to follow suit. I understand the need to carry a bottle or buy bottled water in certain countries where it’s hot or the quality of tap water is questionable. But why not carry a reusable plastic bottle and refill it at safe sources? Water fountains throughout North America and Europe are perfectly safe. In India and Africa, all of us had water carriers and filled up for free at restaurants deemed safe (and they were) or expensive hotels that were more than happy to accommodate us. For those who don’t like the taste of tap water at home, Brita and PUR offer filtering systems that attach to faucets and showerheads, in addition to pitchers that fit in the fridge, filter drinking water as needed or refill plastic bottles for use outside the home. Carrefour in Greece offers Brita and other comparable systems. I’ve had mine for 15 years and replace filters every 3-4 months with heavy use. We haven’t bought bottled water for some time now with a couple of exceptions. I know in Germany no one drinks tap water, what about Greece. Is the municipal water supply safe? In Germany a lot of people drink tap water. But a lot of people buy bottled water with bubbles in it, so called “mineral water” – same for Switzerland and Austria. Also in those countries bottles are mostly recycled. Here in Athens I drink only tap water at home, it’s good enough. I sometimes buy 1/2 liter bottles of water at kiosks, when I’m in situations where filling up would be complicated. I’m reusing those so I can have my tap water cooled in convenient portions at home. But of course in the end they get thrown away (nowadays into the blue recycling waste containers). At the office the tap water is not potable, we’ve got big jugs of water for a water cooler system. At least the jugs are reused. There are islands in Greece where the tap water quality is just not good enough. It’s hard to solve that on a personal level. Conclusion: In Greece the “municipal water supply” is of wildly varying quality, it might go from excellent quality to undrinkable bad taste from one village to the next. Athens tap water in in general considered to be potable, albeigh some people claim a chlorine taste. Actually, the tap water in Germany is perfectly safe to drink and often of better quality than the bottled water, either still or with bubbles, but as betabug mentiones, sales of bottled water are huge here. I stick to tap water myself and it suits me fine. I’ve yet to see a water fountain in Germany, unfortunately. I’m also all for carrying a reusable plastic bottle, but there are issues about refilling it many times if you don’t have a chance to really get it clean between refills. Every time you take a sip, you’re introducing bacteria into the water and that can get pretty yucky after a while. Betabug is correct. Based on my experience, water quality varies widely depending on where you are. In some places, you can see and smell that it’s not good; this is why I brought over my filtering system. In some places, such as where I am now, it’s quite fine and the filtering is really optional. My reusable bottle is a pop-top that screws off at the mouth so I can wash it (in the USA, you usually get one with your water). My mouth doesn’t even need to touch the top because I can squirt the water or sport drink right into my mouth. I’ve used the same one for 5 years. My fiance trains every other day and has used the same bottles for more than a year without trouble or disease. He only rotates out when one of them gets a hole. When I traveled throughout Europe many years ago, I found places to refill. There were water fountains in the train stations in Germany, but I realize they may not be there any longer. Things change in many countries. Here in Halkidiki the tap water is considered less than safe…I found out after drinking it for a week. I am still standing, not sick. The water did taste a little funny but again, I am fine. MIL serves only bottled water and just yesterday I asked her if there were recycling programs set up and she said yes, but you have to take the bottles there yourself. She’s not interested in carrying bottles through the village so I offered. Now we need to get her to save them from the trash so that I can do it. The timing of your post is incredible. Great article!! Doesn’t this situation make you laugh… that people pay for bottled tap-water more than people spend on Gasoline?? I just think… people keep blaming cars and gas as the number one reason we have global warming… but there are no commissions on regulating and not allowing tap water to be bottled. Hello there, I understand that this post is not very recent, but I just stumbled upon it and felt a great urge to add my two cents. I recently moved from Berlin to Athens and must say that I just can’t get along with the high levels of chlorine (and its highly carcinogenic disinfection by-products) in local tap water! Before, I used to drink tap water all the time, now I find myself forced (by my ‘tastes’ and a lack of a filtering system at the dorm) to buy (and subsequently recycle) plastic bottles filled with mineral water. It’s inconvenient and I don’t like it, but there is a huge difference between bottled water and tap water. Even if it isn’t from a mineral spring, as the two (rather exeptional) examples you’ve mentioned in the beginning – at least they’re purified & chlorine free. Thank you for the tip, I’m going to lobby my landlords to buy one, in that case. Have a nice day! In some areas of Greece, the tap water is quite OK. In others, definitely not. It also depends on the day and who is in charge. As it says in the article, the filtering systems include pitchers with filters, so they’re portable and can be used in a dorm, if you’re interested. The landlords aren’t at fault for quality of water and will likely file your request under “funny foreigner” (aka, “pffft, xeni”). Good luck.